Poised with a composed nature, courageous, but always in control—they’re qualities only a handful of us could say we have in a job interview condition. But when it comes to being an employed Police Scotland dog, they’re all essential skills—those and a noble relationship with your crime-fighting companion. Police Chief David McIntyre has been with Rudi for a year since he was just a 12-month-old pup. “Rudi trained as a general purpose dog, which involves tracking humans. That includes wanted criminals and missing people too. It takes a lot of manpower and resources to search for people, but Rudi will take minutes rather than hours,” McIntyre said. Majority of individuals question the cop if it’s all smelling outfit and directing the dog in search of the same trail. He added, “That’s an old school idea. If it’s a wanted suspect then we might not know who they are yet. If it’s a missing person, there might not be any clothing available. “Dogs like Rudi are trained to track fresh human scent in places like the woods, and in an open field he’ll be allowed to search freely and indicate to the handler who or what he finds. To enhance the dog’s abilities, police dogs take a 13-week course, then train whenever possible from a base in Pollok Park. That continuing procedure means that dogs are paired with handlers for the length of their career and sometimes beyond. David explained, “There’s very much a bond between the two of us, like father and son or best friends. It’s more like a family relationship, compared to working with another human being, a colleague. “Rudi very much relies on me and I rely on him, so it’s a very special bond we both share. “It’s all play for him. Everything we do, we try to make it happy for the dogs. And when Rudi finds someone and he’s barking, that’s him telling everyone he’s done a good job. 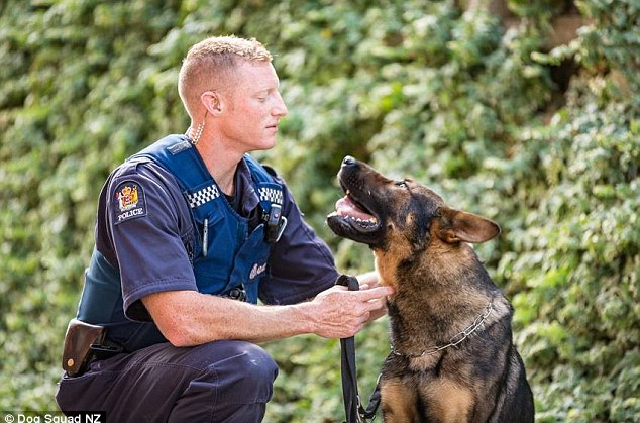 So what becomes of a police dog when it retires? David said, “Some dogs will retire and live with their handler, although sometimes it’s not practical for the dog’s well being; and if someone has been working for years, then they could end up with five or six dogs.